A graduate of Salpointe Catholic High School, he played football there from 1971-1975, earning numerous awards including being named High School Player of the Week four times. He also wrestled. He went on to college and played football for one year at the Air Force Academy and one year at Northern Arizona University. He graduated from NAU in 1982 and came back to Tucson to attend the UA where he received a Masters in Business Administration in 1989. He was a teacher and coach at Salpointe from 1982 to 1985, coaching football, wrestling and basketball. He also coached at the University of Arizona under Coach Larry Smith from 1984-1987, helping take the team to the Sun Bowl in 1985; the Aloha Bowl in 1986; and the Coca-Cola Bowl in Japan in 1986. He coached defense and was directly responsible for kickers and punters, including Max Zendejas, Ruben Rodriguez and Mark Walczak. 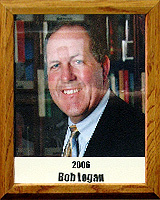 He is founder of the Salpointe Sports Hall of Fame and worked with the Welch’s Circle K LPGA tournament. After his coaching days, he went into sports administration and development from 1992-2001. In 2001, he became Senior Director of Development for the College of Science at the UA, a position he still holds. He has been involved in numerous fundraising activities for organizations such as Rotary, St. Cyril’s School, the YMCA and Tucson Arizona Boys Chorus, as well as maintaining close ties and assistance with his alma mater, Salpointe.